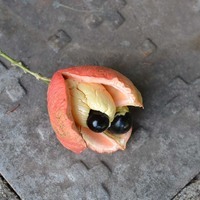 Originating in tropical West Africa, the Ackee tree is cultivated for its fruit which are cooked and eaten as a vegetable. It is now widely, though sparingly distributed outside of its native range, except on the island of Jamaica where its extensive cultivation has caused it to become naturalised. 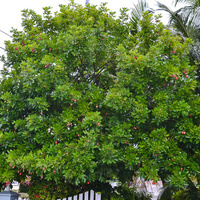 Under favourable conditions, the tree may reach heights of up to 25 m (80 ft), though is more commonly 10 to 15 m (30 to 50 ft) tall with a straight, stout trunk supporting a densely leafy rounded crown. The bark is pale grey and smooth. Leaves large and compound, being made up of glossy green oval leaflets, each 12 to 20 cm (6 to 8 in) long and arranged in pairs along the length. A typical leaf is made up of three to five pairs of leaflets and their dense arrangement casts a deep shade. They remain on the tree in all seasons. Flowers small and insignificant, cream-coloured, either bi-sexual or male and held in branched clusters arising at the ends of the branches, though they may be partly obscured by the leaves. They come into bloom at the start of the rainy season in seasonally dry areas but bloom on and off throughout the year in areas where the dry season is short or where humid conditions prevail. 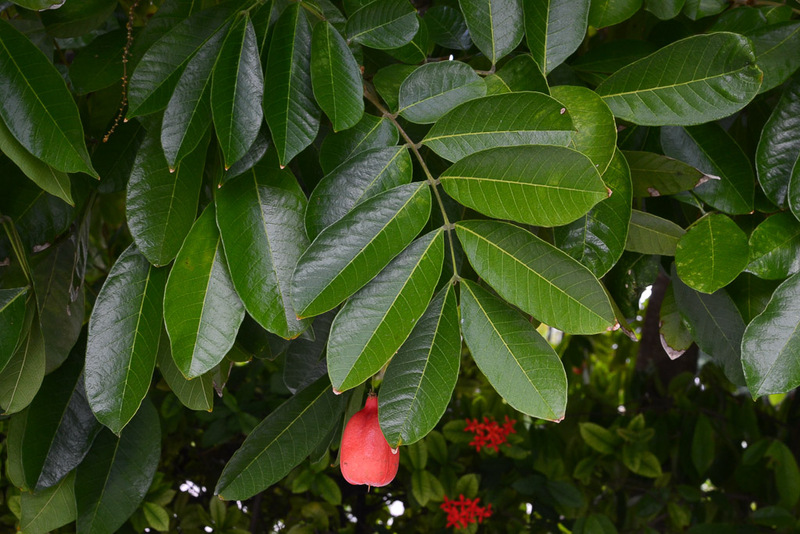 The flowers are followed by light-green, bell-shaped fruit that become bright red when mature. 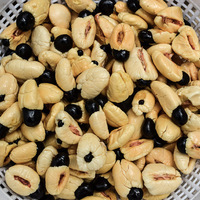 The fruit has a thick fibrous shell that splits at the base when fully mature, separating into three segments, each shielding a soft, pale yellow or creamy-white aril with a glossy black seed attached. There are two named varieties in cultivation, 'Butter' with a soft, bright yellow aril and 'Cheese' with a somewhat firmer, cream-coloured aril. 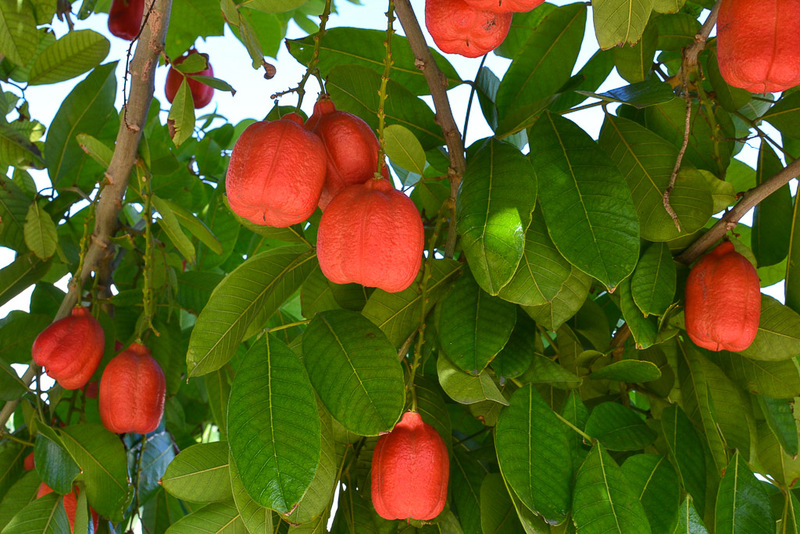 All parts of the fruit are poisonous, yet the arils are eaten in some countries, particularly in Jamaica where it has been adopted as the national fruit. After removing and discarding the seed, the arils are carefully cleaned, leaving only the soft yellow or cream-coloured flesh which is then simmered, usually in lightly salted water. At the end of the simmering process, the water is drained off and discarded as a precaution. The drained and softened arils are then sautéed, usually with black pepper, herbs and spices. In Jamaica, flakes of salt-preserved cod fish are added to make that country's most esteemed dish, 'Ackee and Saltfish.' When cooked they have a soft, buttery avocado-like texture and an agreeable, slightly nutty flavour. 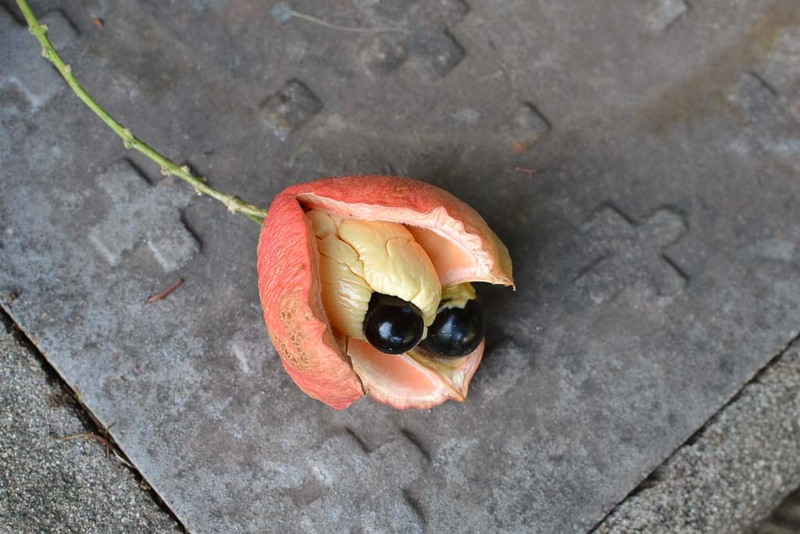 Ackee trees produce a medium-weight wood, in the 600 to 650 kg per cubic meter (37 to 41 lbs per cubic ft) range, with reportedly good natural resistance to rot, decay and wood-boring insects, though this is not well researched. The heartwood is pale gold- to orange-brown. Logs, when available are sawn into planks mostly for making furniture or into beams for railway sleepers. However, the trees are not usually felled in areas where the fruit is eaten and has economic importance. The pruned branchwood can be used for firewood and for making charcoal. Honeybees can be observed vigorously working the flowers, but the tree's importance to honey production is unknown. The cooked arils contain high levels of Vitamins A, B1 (Thiamine), B2 (Riboflavin), B3 (Niacin) and C (Ascorbic acid), as well as high levels of Oleic acid, an Omega-9 fatty acid that helps to maintain healthy blood cholesterol levels. 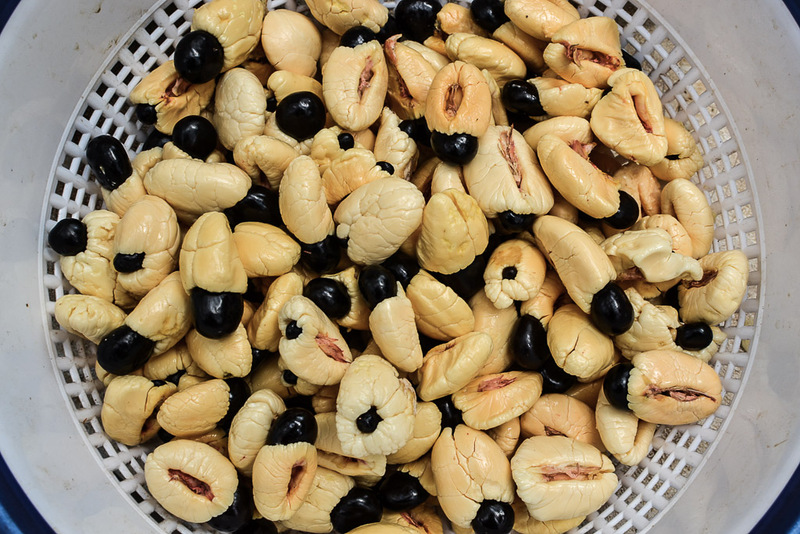 Ackee was for years banned from being imported into the United States, but in 2012 the FDA (Food and Drug Administration) granted an exemption to a 'Green List' of exporters, which according to the FDA demonstrated that they have controls in place to ensure their product is safe. Grows and fruits naturally in sub-humid to humid subtropical and tropical climates, generally in frost-free areas with annual lows of 17 to 25 °C, annual highs of 26 to 35 °C, annual rainfall of 800 to 6000 mm and a dry season of 2 to 7 months. 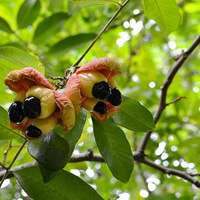 Although Ackee trees also grow well in wetter climates with no dry season, flowering is usually poor due to fungal attack, resulting in low fruit production. Further, the trees may fail to flower and fruit altogether in areas where the average low of the warmest month falls below 18 °C (64 °F). New plants can be started from seed or from cuttings. Seedlings start to flower and bear fruit when around three years old but are not true-to-type, so cuttings are preferred when selected varieties are to be cultivated. Performs best on free-draining clay-loam, loam and sandy-loam soils of a moderately acid to slightly alkaline nature, generally with a pH of 5.5 to 8.0, and on sites with full sun exposure. Although it also grows well on alkaline soils, with a pH of 8.5 or more, fruit production is significantly reduced. It has good tolerance to drought but poor tolerance to slow-draining or permanently waterlogged soils. 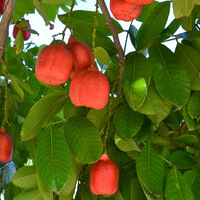 Trees in South Florida yield from fifty to two hundred fruit per season, depending on the size of the tree and the growing conditions. 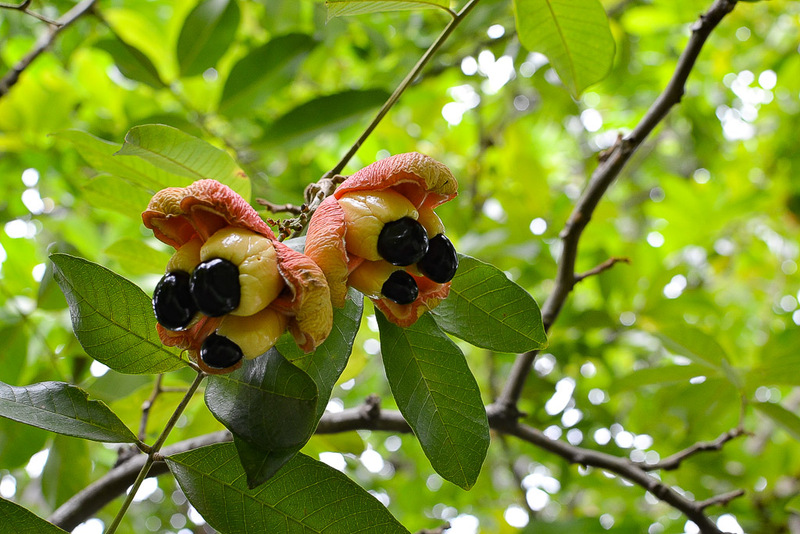 The fruit is poisonous if improperly harvested and prepared, containing the potentially deadly peptide hypoglycin. 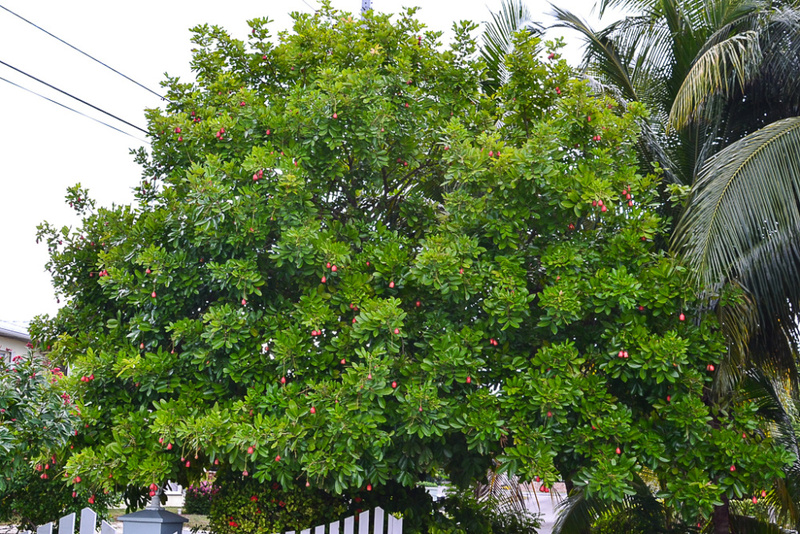 Only fruit that are on the tree and that have opened naturally, showing their arils, should be harvested. Unripe, unopened fruit or fruit that have opened and fallen to the ground are considered a poison risk and are not to be consumed. The seed germinate readily but because of their relatively large size, they would need large animals or rodents to disperse them. 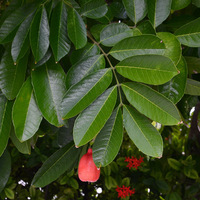 It has naturalised in Jamaica, although this is due to its extensive cultivation in that country. In Australia, it is recorded as having escaped cultivation and as a weed of the environment in some areas, but there does not appear to be any record of it being a serious weed anywhere in the world.